"Christmas Creep" has officially been taken to a new extreme. After years of watching Black Friday sales move into Thanksgiving week and Christmas commercials appear earlier and earlier in the year, OfficeMax (OMX) decided to just go ahead and hold its first holiday sale in May. The retailer sent around an email to subscribers this week announcing a countdown to its "Halfway to Cyber Monday" sale. The sale -- first noticed by Consumerist -- has now begun, promising online discounts of up to 75% and a printable coupon for $10 off $40. It's plugging the sale with the tagline, "Deals so hot, it's like Cyber Monday." Cyber Monday, of course, is e-commerce's answer to Black Friday, and takes place every year on the Monday after Thanksgiving. Evidently the idea here is that Cyber Monday is six months away (though that's not exactly true -- Thanksgiving doesn't come until Nov. 28 this year, so Cyber Monday technically doesn't come until Dec. 2). This isn't the first time a company has tried to use the "Cyber" brand well before Christmas: Last year, Costco declared a week in August as "Cyber Summer." 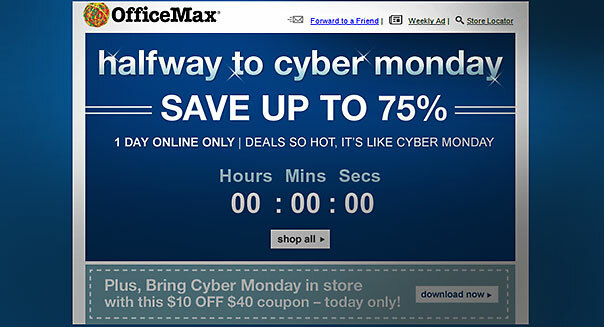 If OfficeMax's promotion is successful, we fear that every online sale may soon deem itself "cyber" and run the word into the ground.